Whether you're a die-hard PlayStation 2 fan or a new player, this PlayStation 2 console will meet the demands of your game playing. The smaller, sleeker design makes it easy to carry around and enjoy games a ny time, anywhere. 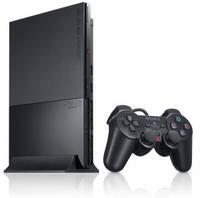 It keeps the PS2's powerful 300MHz processor, for enhanced clarity and mesmerizing graphics. Equipped with an integrated Ethernet port for network gaming, the PlayStation 2 sets new standards in the fusion of design and functionality. Approximately 40 percent of North American PlayStation 2 online gamers use dial-up connections and to satisfy this base, the North American model is equipped with both Ethernet and modem ports. Includes PlayStation 2 console, Analog Controller (DUALSHOCK 2), AV Cable (integrated audio/video), AC Adaptor (AC power cord included).